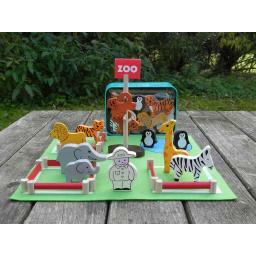 Time to take an animal safari with this sweet little zoo set in a tin. Classic zoo fun with an assortment of wooden animals, a zookeeper, fencing, sign, tree and a playmat. Not suitable for children under three years of age.